QUINCY, MASS. 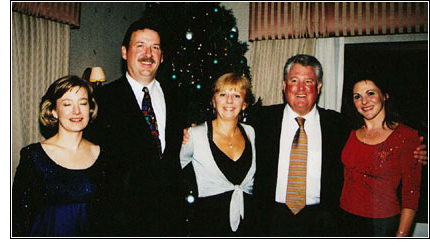 — About 100 people — including present and former staff members, strategic partners, friends and family — recently joined Mark Dickinson at the Marshfield Country Club in celebration of his company’s 25th anniversary. 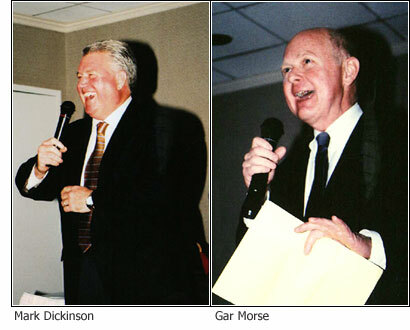 Among the speakers who good-naturedly traced the firm’s first quarter century were several of Dickinson’s longtime friends including David Keefe, CEO of Atlantic Broadband, Ralph Yohe, CEO of the South Shore YMCA, ; Gar Morse of Morris & Morse Co, Inc., and Paul Finn, a retired high school football coach who played college ball with Mark, who is now part of the Dickinson team. Joining in the festivities and greeting guests were members of the company’s core staff: Vice President / Construction Ed Shaw; Vice President / Development Services Taryn Warren; Controller Margie Bjork; and Office Manager Sandy Smith MacDonald. Dickinson Development, founded in Quincy in 1980, has earned a reputation for commercial real estate development and project management at the highest standards. It has developed over three million square feet of commercial property in New England and Florida, including shopping centers, office parks, hotels and industrial buildings. One of the company’s most recent successes is the transformation of Reading’s former municipal landfill into the $90 million Crossing at Walkers Brook specialty retail center anchored by Home Depot and Jordan’s Furniture. Phase II of the center opened this past year at 100% occupancy, and Phase III, a proposed Stop & Shop supermarket, was just announced. Other notable projects over the past 25 years have included redevelopment of the old Willard School into first-class offices; the transit oriented 200 Newport Ave, North Quincy, construction of the twin building Braintree Executive Park; two Home Depots; two Shaw’s Plazas; the three- building Orlando (Florida) Executive Center; two Staybridge Suites Hotels; and the 30-acre Kellaway Intermodal & Distribution Systems complex in Randolph, Mass. A 1969 graduate of Amherst College, Mark Dickinson devotes energy and resources to several area causes including the South Shore YMCA; Scituate’s Inly (Montessori) School, the North River Community Church of Pembroke; the South Shore Chamber of Commerce, and Quincy 2000. (For more information, visit www.DickinsonDev.com).